Cannabis sativa has been employed for thousands of years, primarily as a source of a stem fiber (both the plant and the fiber termed “hemp”) and a resinous intoxicant (the plant and its drug preparations commonly termed “marijuana”). Studies of relationships among various groups of domesticated forms of the species and wild-growing plants have led to conflicting evolutionary interpretations and different classifications, including splitting C. sativa into several alleged species. 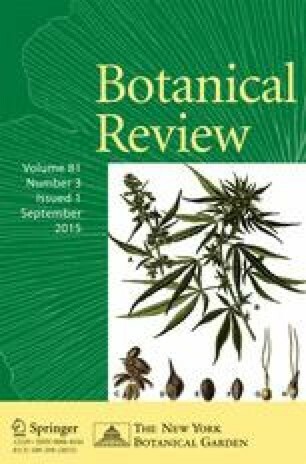 This review examines the evolving ways Cannabis has been used from ancient times to the present, and how human selection has altered the morphology, chemistry, distribution and ecology of domesticated forms by comparison with related wild plants. Special attention is given to classification, since this has been extremely contentious, and is a key to understanding, exploiting and controlling the plant. Differences that have been used to recognize cultivated groups within Cannabis are the results of disruptive selection for characteristics selected by humans. Wild-growing plants, insofar as has been determined, are either escapes from domesticated forms or the results of thousands of years of widespread genetic exchange with domesticated plants, making it impossible to determine if unaltered primeval or ancestral populations still exist. The conflicting approaches to classifying and naming plants with such interacting domesticated and wild forms are examined. It is recommended that Cannabis sativa be recognized as a single species, within which there is a narcotic subspecies with both domesticated and ruderal varieties, and similarly a non-narcotic subspecies with both domesticated and ruderal varieties. An alternative approach consistent with the international code of nomenclature for cultivated plants is proposed, recognizing six groups: two composed of essentially non-narcotic fiber and oilseed cultivars as well as an additional group composed of their hybrids; and two composed of narcotic strains as well as an additional group composed of their hybrids. All scanning electron microphotographs are by E. Small and T. Antle. B. Brookes and B. Flahey assisted with preparation of illustrations. Unless otherwise acknowledged in the figure captions, photos are by E. Small. B. Brookes skillfully assembled and enhanced the illustrations for publication. Creative Commons Licenses employed in this article: CC BY 2.0 (Attribution 2.0 Generic): http://creativecommons.org/licenses/by/2.0/; CC BY 3.0 (Attribution 3.0 Unported): http://creativecommons.org/licenses/by/3.0/.